There were some broken hearts in Potomac Villagethis week when Mix Bar & Grille closed its doors just ahead of Valentine’s Day. The tables were set for dinner and there was no “closed” sign on the door when we stopped by, but the restaurant’s voicemail was full with no sign of activity inside. A sister restaurant in Silver Spring also wasn’t answering the phones this week. If Mix is gone for good, it will be the second eatery to close in the past two months at the Potomac Promenade shopping center on Falls Road. Fortune Garden departed in December, and the search is on for a new tenant. Click here for more. This week brought some bad news for Land of Nod, the kids’ home decor company known for its colorful, whimsical styles. Parent company Crate & Barrel plans to close all the brick-and-mortar Land of Nod stores and discontinue the adorable Land of Nod catalog, reducing the company to a website with a limited selection of products. The good news is that some Crate & Barrel stores — including the ones in D.C. and Tysons Corner — will start carrying Land of Nod merchandise on the sales floor. Look for that to happen this spring. For those who haven’t heard yet, the historic Hank Dietle’s Tavern was destroyed this week in a fire caused by “discarded smoking materials” on the front porch. It’s unclear what will happen to the remains of the century-old dive bar, a Rockville Pike landmark that held the first liquor license in Montgomery County. The fire came just weeks after the closing of Helen’s, the neighboring restaurant that had been struggling to stay in business this past year. Owner Helen Wasserman had told Store Reporter that business was slow and she came close to closing several times before it finally happened. More in our Nov. 30th issue. Yet another round of exits to report at Westfield Montgomery Mall this week. 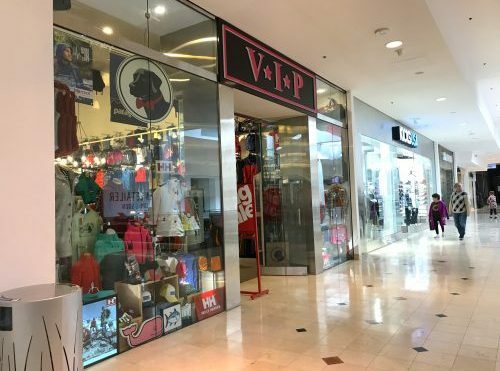 The V*I*P clothing store will be closing in the next few weeks after a disappointing holiday season. Pen Boutique, which has been selling fine writing instruments at the mall for a decade, is also on the way out. And we’ve seen the last of two short-lived tenants, the Euphrasie dress shop and the Flexy custom printing store. Last week brought the departure of several stores in the Macy’s wing (click here for more). So who’s moving in this spring? Find our most recent info here — and watch Store Reporter for updates.